SHANGHAI, Aug. 8, 2018 /PRNewswire/ — The 16th China Digital Entertainment Expo & Conference (“ChinaJoy”) was held at the Shanghai New International Expo Center between the 3rd and the 6th of August, 2018. The theme of the event – “new technology, new entertainment and new value” – not only highlighted the viability of China’s digital entertainment industry, but also attracted significantly more attention from the general public. 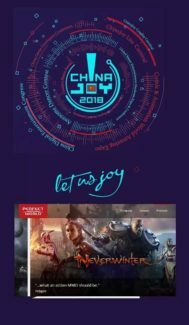 As a 16-time partner of ChinaJoy, Perfect World took part in the event with 18 new game titles, accompanied by several pan-entertainment providers, partners and a large contingent of players who came from the four corners of the globe to gather at the world-leading entertainment event. On the morning of August 3rd, Perfect World CEO Dr. Robert Xiao delivered a welcome speech to players visiting the Perfect World booth, announcing the game publisher’s formal start of its exhibition. The CEO mentioned the company’s new tagline for its games “Enjoy the Difference”, which represents an important part of Perfect World’s strategy of creating games that resonate with those born in the 1990s, 2000s, and 2010s. Perfect World aims to deliver an unprecedented suite of experiences to players via new products as well as via exciting events to be held at the booth, including DOTA2 and CS:GO e-sports contests. He looked forward to the players who stopped by the booth having a fun time at the four-day event. Perfect World’s 18 products on display consisted of e-sports titles including DOTA2 and CS:GO; mobile games including the Return of the Condor Heroes II, The Legendary Swordsman, Albireo, Perfect World, Legend of Fox Spirit, Lost Realm, Fire Like The Song and Samsara; independent games including Hidden Dragon Legend, Absolver, Human: Fall Flat, The Flame in the Flood and HOB; two games that were developed by overseas studios, Unruly Heroes and Subnautica; as well as FARSIDE, a tactical shooting game available in both cloud gaming and PC versions, come together to give players access to tactical shooting, MMO games, anime culture, martial arts-based MMO and sandbox MMORPG titles, all of which are particularly popular among younger players. Players were invited to have a go with most of the games on display at the booth, including the Return of the Condor Heroes II, Perfect World, Legend of Fox Spirit, Human: Fall Flat, Unruly Heroes and FARSIDE, etc. Perfect World’s new game FARSIDE turned heads on the first day. DOTA2 and CS:GO e-sports contests held at the main stage generated a lot of positive feedback from players, with the TyLoo team attracting a large number of CS:GO fans. Within a few minutes, the contests quickly became standing-room only events.